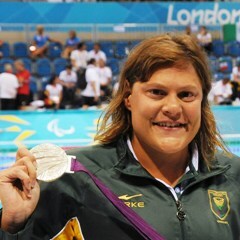 London - South Africa's Natalie du Toit broke down in tears Friday after swimming the final race of her stellar career, bowing out at the London 2012 Paralympics with a silver to add to her impressive medal haul. Du Toit was beaten into second place in the women's 100m S9 freestyle in her last race before retiring, and could not stop the tears from flowing afterwards. The 28-year-old bade farewell with 13 Paralympic gold medals to her name, including three won at the Aquatics Centre in east London. Fourth at the turn, Du Toit swam the two lengths in 1:03.45 and was beaten by Australia's Ellie Cole, who clocked 1:02.77. "It's all over," Du Toit said on leaving the pool. "I walk away with absolutely no regrets. "I look back and I think I gave everything. No matter what emotions you go through I gave everything in the pool, everything as a person and I'm satisfied. "I went a bit slower tonight than I did this morning (in the heats). Ellie's obviously a great competitor and to go out there and get a silver I think is a little bit disappointing but it's still a medal." Overcome with emotion, Du Toit took a parting swipe at her detractors. "To think that three or four months ago I was not coming," she said. "It's been a tough couple of months and to get into a pool and just swim, and to qualify and to be told that you're not good enough was really, really tough," she said through her tears. "To those that were against me, hopefully they will get their day one day." The Cape Town swimmer's story of courage in the face of a major setback has inspired millions. Du Toit represented South Africa in the 1998 Commonwealth Games in Kuala Lumpur as an able-bodied swimmer. Three years later her scooter was hit by a car as she was returning to school after swimming practice. The teen's left leg was amputated below the knee. In 2004 she swam for South Africa at the Paralympics in Athens and won five gold medals and a silver, winning a further five golds at Beijing 2008. She became the first-ever amputee to qualify for an Olympic event when she swam in the 10km open water race in Beijing. Her achievements have earned praise and admiration from around the world, including from South African icon Nelson Mandela. Du Toit said she had "absolutely no idea" where life would take her next. "I went out there in swimming and took a chance and managed to achieve my best results and it's time to move on and change and show that if you believe in yourself you can go out there and do it. "I'm going to be jobless for the next three months but hopefully in January I'll start studying or working."